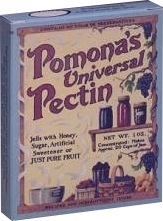 Made in the USA Pomona's Universal Pectin is quite simply the only pectin on the market that is sugar and preservative free. Rather than utilizing sugar to jel, Pomona's is activated by calcium, which is included in the package. This makes it possible for you to make jams and jellies that are either sugar free or that contain reduced sugar. Many folks prefer to use Pomona's and add alternatives sweetners such as honey, fructose, agave or Splenda and other artificial sweetners. Buy in volume and save by purchasing this 4 ounce bag (four 1 ounce bags), which includes calcium and instructions.